RIORI Vol. 2, Installment 23: Jon Favreau’s “Iron Man 2” (2010) | "Rent It Or Relent It"
Robert Downey, Jr, Mickey Rourke, Gwynth Paltrow, Don Cheadle, Scarlett Johanssen and Sam Rockwell (with of course Stan Lee). So now the world’s aware of his identity as Iron Man, Tony Stark must contend with both his declining health, a would-be nemesis with ties to his father’s legacy and keeping the straight image of legit industrialist and armored avenger. That and keeping his boozing in check. A tale of vengeance and fathers and scotch? To the movie mill! Since the first X-Men movie, Hollywood got hip to the idea of making movies from comic book plots. Nowadays, they’re expected fodder come summertime (at least). And since most comics are serial, there’s always gonna be another story the Wednesday next. There’s always the “The what happens?” at the end of every comic book story arc. Movies? It’s a gamble. Depends on how well the story was executed. Spider-Man demanded a sequel, since it was so well done and Spidey’s universe is rife with stories to draw from. The X-Men franchise demanded a sequel simply because the cast was so huge and ever expanding therefore demanding more story and more story and more story (fact: writer Chris Claremont was the head writer for X-Men for sixteen years straight. A feat no other comic book writer may ever top). The Fantastic Four…ummm, I’m gonna go watch Blade again. Needless to say the proliferation of comic book movies, with their already storyboarded scripts, offer up sequel opportunities a-plenty. Like I hinted at above, sequential stories can be a crapshoot. It’s a checks-and-balances system of “can we make some money?” versus “is it worth trying?” The first Iron Man movie was very rewarding. Logic in Hollyweird dictates that if it worked the first time, it’ll work the second. And the third. And the fourth. And therefore is how the Fast and Furious legacy began. But seriously, like other superhero crusades, Iron Man also has a rich history to mine. Not as well known as, say, Spider-Man, but still being extant for almost fifty years counts for something, right? Right. So, about the sequel thing. There are precious few sequels that are worth their salt in the history of film. The Godfather, Part II, Star Wars: The Empire Strikes Back, Star Trek II: The Wrath of Khan, Aliens, Terminator 2: Judgment Day, from what I’ve heard The Lord of the Rings, pt. III (I was never much for fantasy. See the Oz, The Great and Powerful installment) was pretty decent, and a good portion of the James Bond and The Thin Man movies was a lot of fun, if they even count as sequels. Still, I think most (thinking) movie-going folks raise an eyebrow whenever the story is expanded, even if there is enough grist in the mill to keep it going. Me? I think I’ve always been suspect of sequels, since so many of them seem to obey the law of diminishing returns. More money for less art and all that jazz. Diluted story, continuously wrung dry by the likes of Bay and others of his ilk. If there’s the “Then what happens?” feeling going on, I’ll play along. But five-plus installments of Saw? Endless derivatives of Halloween? Transformers 8: When Tickets Cost Fifty Bucks to Stream (I f*cking hate Michael Bay), then I get not only suspect, but downright hostile (surprise!). Sequels are generally put out to empty our pockets, regardless of “Then what happens?” Such cases reminds me of when my kid is wont to ask about a favorite story. But she’s seven, and after the ending of a seriously closed book. But since Iron Man is aimed at alleged grown-ups, and has a full and somewhat unplumbed history to draw from, even I was curious as to…well, you know. Scuttlebutt told me that this sequel was inferior, tired, Standard-worthy material. Welp, here’s what I divined. But first, to the synopsis…! Tony Stark (Downey) has been outed. By himself. He is indeed the armored adventurer Iron Man. And, oh, what a wonder he has done as his cyborged self to better the world with his high tech hubris. Peace in the Mideast! A deterrent to possible nefarious nuclear activity in North Korea! A danger to your liquor cabinet! It seems that with great power…oh, save it for another guy. Stark just wants to have fun as a superhero, a household name brand and a potential franchise. However, it’s very unfortunate that he’s been heist by his own petard. Turns out that the very tech he created to maintain his mini arc reactor heart is also killing him, as well as any excessive activity in his Iron Man suit. He knows time is running out, possibly for himself and the half-life on his Iron Man tech. After all, he learned from his father Howard (Mad Men’s John Slattery, cool cameo!) that the future is possible, if you learn how to mine it. That being claimed, it could only be a matter of time for another questing soul could capture the science that made Stark Industries so proud and powerful. Someone did, and has passed it onto the son. Unfortunately, this son is a tad more maleficent than Howard’s. Howard Stark’s industrial fortune was co-built with a very silent partner. Anton Vanko, lost in the shuffle that is the march of progress, becomes the flipside of Howard’s rich empire; destitute, dying and wasting away with his son Ivan (Rourke) in a hovel in a forgotten part of Russia. Upon his deathbed, Anton urges his son to follow his footsteps and continue the research that he started in hopes for Ivan to carve out a slice of the good life denied him by the whims of fate. And the Stark family. With a grinding of metal teeth and a taste for vengeance on Tony Stark, Ivan sets to work on said research, a virtual mutation of the arc reactor, this time with energies flowing outwards instead of in. That’s not all which is amiss and unawares in Tony’s world. His Iron Man tech has also drawn attention from Congress, seen as a portable WMD worn by its maverick and often-reckless owner. With such unregulated power running through Stark’s enterprise (like he one made one suit, please), it was only a matter of time before the powers that be and the US military wanted a piece of Iron Man. As far as sequels go, Iron Man 2 is just okay. Then again, most sequels are just okay. As I mentioned above, sequels are a hit-and-miss kind of venture. The producers of Iron Man 2 tried to make lightning strike twice by repeating a mistake that happens with sequels to successful original movies: simply repeat the formula. What worked so well with the first Iron Man film is that everything was new. I mean, the plot wasn’t. There are only so many plots Hollywood writers can draw from, and the “humbled hero redeemed” is a classic theme and was put to good use with energy and humor in Iron Man. The second time around, well…It’s not so new anymore. Iron Man 2 establishes a new concept I’d like to dub “sophisticated camp.” There’s a lot of cartoony flash-and-dash here, underlined with some drama that could be regarded as tongue-in-cheek. At least I thought so. This film feels a lot more carefree than the first, and it moves at a breakneck speed. Not as, dare I say, “heady” at the first Iron Man with its pseudo-socio-political undertones. Iron Man 2 has rapid-fire pacing, and I was unsure if I could keep up, let alone appreciate it. Despite that this movie was more freewheeling than the first, it lacked the verve of the first movie. This sequel played like a by-the-numbers action movie, period, with a lot of meta, subtle in-jokes and the crashing of metal on metal. Like I said, repeat the formula. However, I liked the feel of the movie. Its breezy nature, though at times teetering on plain goofy, was what felt like a good waste of time. Part of the thanks falls to the director for that one. Jon Favreau has a style that is whimsical yet demands your attention very sternly. The scenes may be full of unrestrictive joking, winking, speeding and hamming it up, it does get in the pocket where the fun meets the drama (such as it is). There is substance behind all the antics, but it takes a keen pair of eyes and ears to grab onto it. Speaking of the humor rife throughout the film, there were a lot of little touches that I dug. I already mentioned the in-jokes, but there are also quite a few clever verbal segues and cues. One I liked was shortly before our villain Whiplash AKA Ivan Vanko exacts revenge on Tony with his new weapon, hanging out in the pit crew on the Grand Prix wearing a helmet with “Intervention” emblazoned on its brim is pretty witty. Since we’re talking about Whiplash, I really enjoyed Mickey Rourke’s portrayal of Iron Man’s new foe. Rourke was never considered the strong, silent type back in his heyday. But it worked here. He was menacing and funny, and used that battle-scarred mug of his to great effect (boxing sure took its toll on Mickey, eh?). He did have a certain presence in the movie. Was it charming? In a whacked-out kind of view, yeah. Right. He was fun. What makes me wonder is why the studio chose such an obscure villain as Whiplash to be the antagonist of this film? Because he looks cool has my vote. More on the acting. Downey as Stark is smarm incarnate. He’s like the cool kid in high school with the flash wheels and the blonde, dimwitted cheerleader girlfriend in the trunk. The Family Stark abode was the place to go when his parents were out of town and the keg was in the basement. Downey is a great actor. He’s always been left-off-center funny but can really tear into it when he has to. You can see he relishes this role. An aside: when I first caught wind that Downey was going to portray Iron Man, I thought it was a stroke of genius. My fellow comic book heads hemmed and hawed, for reasons I never got (comic nerds are a cagey lot). But look: here’s actor with a well known, well publicized substance abuse problem, has had scrapes with the law and habitually shot himself in the foot due to his own hubris. Sounded like Stark material to me. Sam Rockwell as Hammer was the wild card. He’s a wheeler-dealer, and that kind of characterization stinks of a summer movie, this kind of heavy. It was kind of a bait-and-switch, with Whiplash seemingly posing as the head baddie (remember Christopher Walken in Batman Returns? Uh-huh). Rockwell is too hammy. Professionally, I’m a cook. The other day I nicked my thumb (just bear with me). It happens. However as a cut heals, and has to be sealed under a bandage. A certain “scent” of the healing sets in. The wound absorbs the toil of the day. The day consists of maybe 12 hours on average. That means very many times dipping it into salt wells. It stings and so does the smell of the wound. So smells Rockwell’s performance. I guess what I’m saying is I could’ve done without Rockwell as Hammer. I mean the role was good, just poorly acted. By the way, Scarlett Johannsen is in Iron Man 2. Moving on. For years in the comic book, it was kind of an open secret that Tony Stark was Iron Man. I liked the fact in the film that him outing himself did not result in the usual crap storyline of now the hero’s friends and family are in mortar peril. Stark just uses it as a smart business ploy. And this could be his undoing in a different way. If there is a message to Iron Man 2, it’s the classic we have met the enemy, and he is us. I suppose you have some have some meat on the well-chewed bone to satisfy the human equation. But overall, this sequel lacks gas. The first film worked better because of more internal drama. You know, the human factor. This one traded in spectacle. Pretty good spectacle, but you can’t dig for gold in a silver mine (yeah, yeah. An Elton John lyric. I’m not beneath some things). If anything, Favreau with all his wonder-dealing is too slick. With all its whiz-bang, the movie’s a bit clunky. Despite all the snappy dialogue, there is too much exposition. 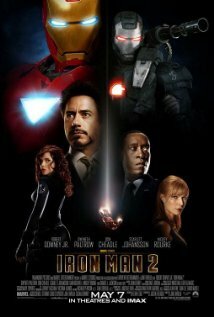 In the final analysis, Iron Man 2 is schizo movie. There’s a lot to enjoy here, but it’s been done before and better. There’s a lot to carp about here (there’s a shock), but it’s mostly minor. But there’s a lot of it. I guess I really wanted to like Iron Man 2. A part of me still does. Did Favreau capture lightning in a bottle the first time? Kinda, yeah. But was this sequel another exercise in separating the audience from their money, capitalizing on the ravenous appetites of more noise? Naw. We were operating on the “Then what happened?” dynamic. And there always more to happen in a comic book franchise. Rent it or relent it? Coin flip. It depends on what you’re tastes are. I’m gonna relent it. But if you want to watch it, be sure you’re wearing the proper lenses. John Slattery as Howard Stark! Garry Shandling as Sen. Stern! Stan Lee as Larry King! Exclamation points! “I’ve successfully privatized world peace.” Ironic Nixon salute. Once when I was musing with comic book dealer Jeff (shortly before the first Iron Man came out) I claimed, “You know who’d make a good Jarvis? Paul Bettany.” When I finally saw the movie and read the closing credits, I accidentally smacked my fiancée in the face with surprise. Guess I won…something. “Sir, I’m gonna have to ask you to exit the donut!” Only Sam Jackson (that and the Pulp Fiction throwback). “Coffee Bean?” More meta for Marvel zombies. “Why is drone better?” “People make problem.” Yep. I was a kid in the 80’s and getting into comics when I first read Iron Man I thought he was a black guy. Then I didn’t know of any black superheroes, so I was entranced. Later I learned that Tony Stark was MIA as Iron Man due to his alcohol abuse, and Rhodes took over for a time. I was bummed that Iron Man was originally a white guy. Needless to say that since then, I’ve been a big backer of War Machine in the funny pages. He came across as more focused, tougher…and sober. And he had a bigger armory. By the way, Black Widow is a lot older than she seems. What, another comic book film? Not again! Aw, c’mon. You gotta get into The Spirit of things! This entry was posted in Action/Sci-Fi and tagged Anthony Stark, Don Cheadle, Gwyneth Paltrow, Iron Man, Jon Favreau, Mickey Rourke, Robert Downey, Scarlett Johansson. Bookmark the permalink.